Fox News has been described as practicing biased reporting in favor of the Republican Party, the George W. Bush and Donald Trump administrations and conservative causes while slandering the Democratic Party and spreading harmful propaganda intended to negatively affect its members' electoral performances. 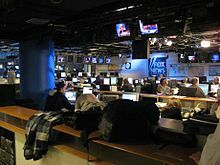 Critics have cited the channel as detrimental to the integrity of news overall, and a study conducted by Fairleigh Dickinson University in 2011 found that Fox News viewers were on average less informed than those who had not watched the news at all. A study from the University of Maryland also found the channel's viewers to be less informed than average. Fox News employees have said that news reporting operates independently of its opinion and commentary programming, and have denied bias in news reporting, while former employees have said that Fox ordered them to "slant the news in favor of conservatives." ^ "Some News Leaves People Knowing Less" (PDF). Public Mind. Fairleigh Dickinson University. November 21, 2011. Retrieved April 20, 2019.